Have You Tried Tang Yuan? Yes, I love the sweet taste and the colorful "marbles"
Dongzhi Festival is one of the most popular Chinese festivals celebrated by Chinese families all over the Asian countries. Before the Dongzhi Festival arrival, it is compulsory for the Chinese family to give thanks to the Gods of the Chinese temple by offering fruits, red oil lamp and burning joss sticks as their heartfelt gifts. The Chinese descendants thanked the Gods for blessing them with good luck throughout the year and pray earnestly for the next year good health, excel well in studies and abundant prosperity in business and work related matter. This visit is usually done one or two weeks before the Dongzhi Festival which is held yearly on the 22nd of December. This story of how Dongzhi Festival was created had been handed down for generations. The birth of “Tang Yuan” was first originated from a scholar by the name of Zhang Zhongjing from the Han dynasty. It was believed that one freezing winter day, he saw some poor civilians who were unable to fend themselves because of poverty, were suffering from shivers and hungers. These civilians were also suffering from frostbite; reddish, swollen and itchy skin on their ears due to cold winter. 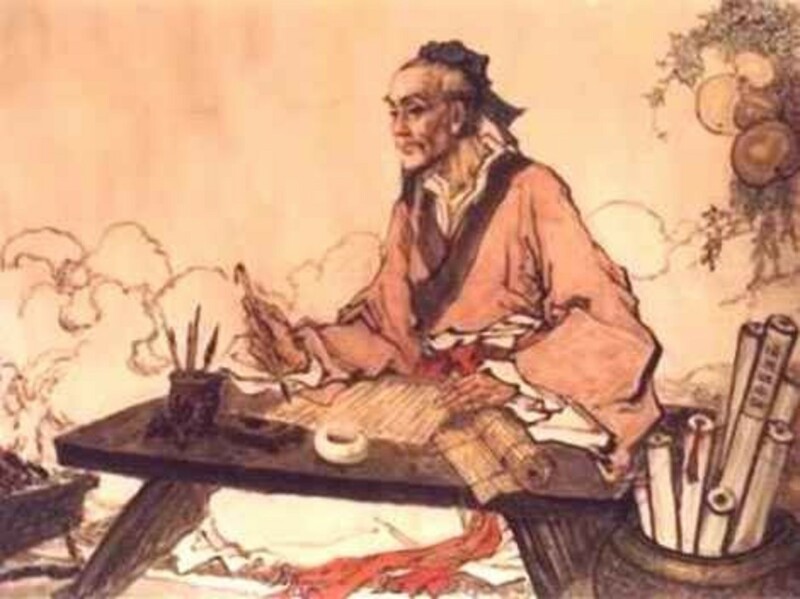 Zhang Zhongjing was a kind man. He felt sympathetic towards the poor civilians that he ordered his apprentices to make dumplings with lamb meat and other ingredients in order to warm up the civilians’ bodies and ears to prevent the frostbite from deteriorate further. Hence, everybody applauded for his kind gesture and followed his footsteps from that day onwards. For centuries, “Tang Yuan” main ingredients kept changing from meat to non-meat in order to cut down cost and to reduce the preparation process. Regardless of what ever ingredients are substituted, “Tang Yuan” is still served during Dongzhi Festival where everyone in my family loved very much. What Does Tang Yuan Symbolize? In the Chinese language, the word “Dong” means winter while “zhi” is the arrival; literally means “The arrival of Winter”. Coincidentally, it is also the last festival of the year as according to the Chinese calendar. During the early centuries, it had been a traditional practice for the Chinese farmers to put down their farming work tools and head for home in order to welcome the Dongzhi Festival with family members. It is the wives duties to prepare the big feast which includes the glutinous rice balls also known as “Tang Yuan” to mark the special occasion that everyone have been waiting for. According to Chinese traditional elderly folks, it is claimed that “Tang Yuan” symbolized reunion, unity and harmony in the family. Hence, it is compulsory for every members of the family to gather together at home for this special occasion. 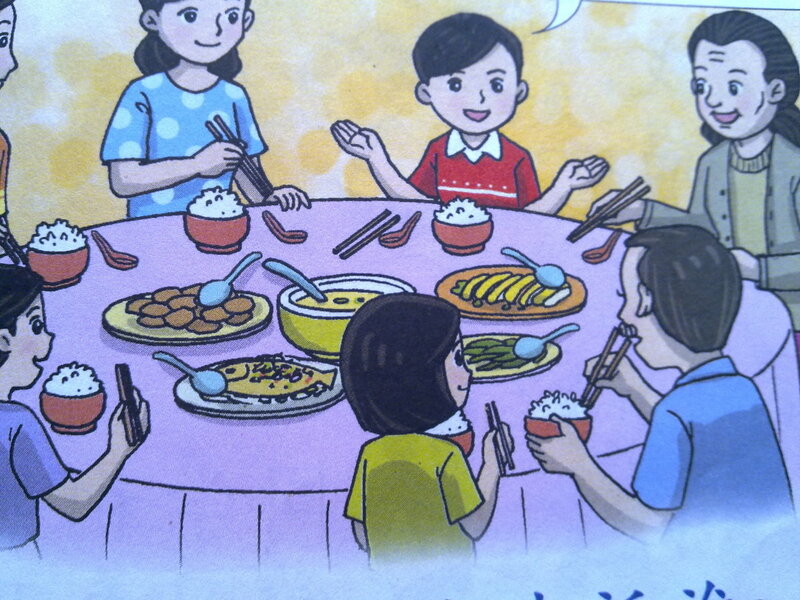 Currently, in the modern century, Chinese people do not celebrate Dongzhi with a grand feast anymore. 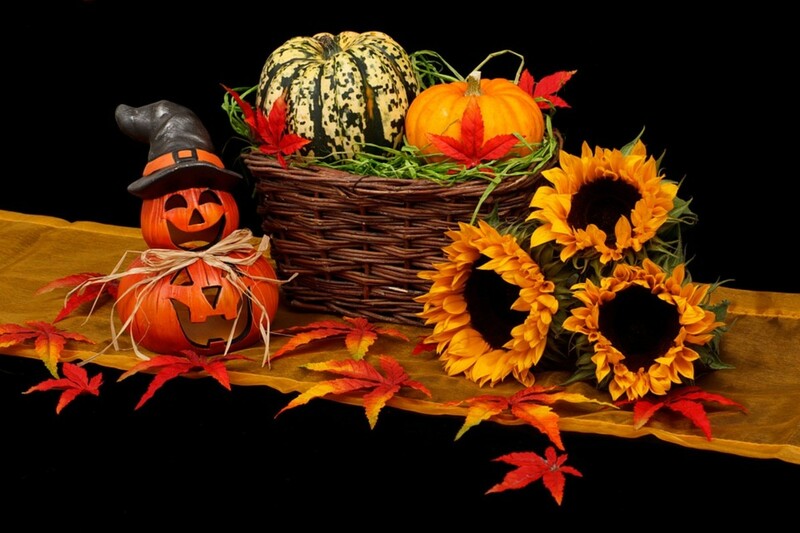 Everything has been simplifies and shortened and make it easy to celebrate with minimal preparations. Old folks remind their middle aged children and younger generations of grandchildren that it is time for a family gathering, to get together by returning home for a simple “Tang Yuan” sweet soup. 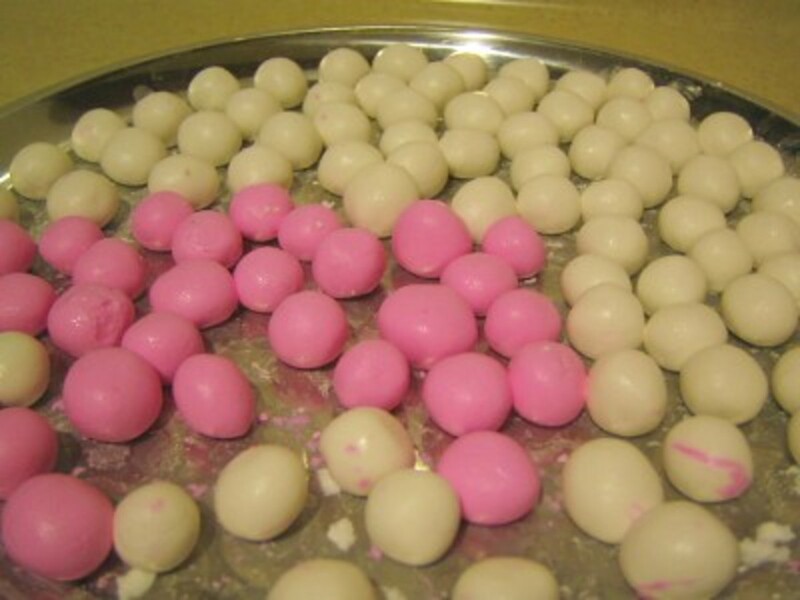 They celebrate the coming of Dongzhi Festival by making and eating “Tang Yuan” or glutinous rice balls which signify one is a year older, should act sensibly and be a responsible person. How To Make Tang Yuan? Usually, the daughters, daughter-in-laws and grand daughters will get together to roll out big and small glutinous rice balls and drop each of them into a big pot of boiling water. 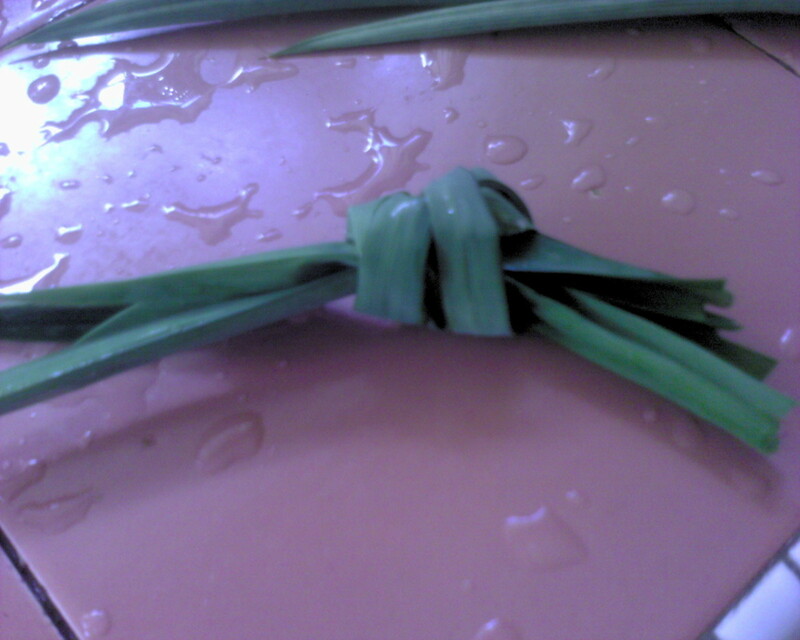 Pandan (screwpine) leaves are tied into knots and dropped into the boiling water to bring out the fragrant smell. 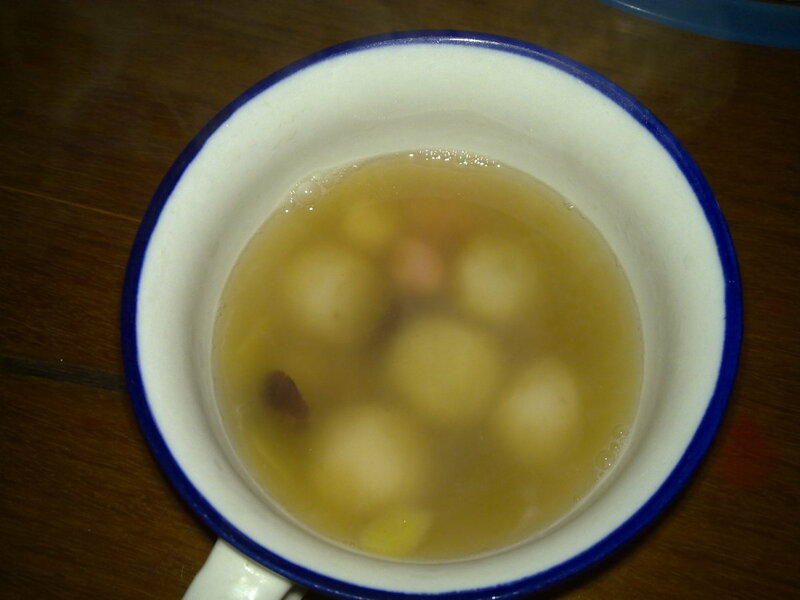 In order to sweeten the “Tang Yuan” soup, some people add in rock sugar or castor sugar to produce clear soup while some add in gula melaka (brown sugar) to produce light brown soup which is less sweet and much healthier too. 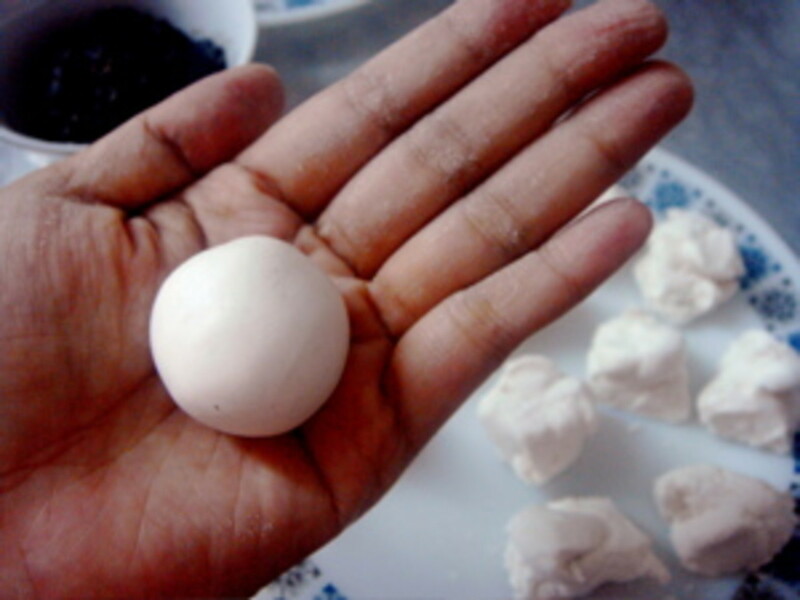 During the olden days, “Tang Yuan” were made plain white color glutinous rice balls. Nowadays, there are various creativity to attract young generations to celebrate this special festival. “Tang Yuan’ are divided into 2 portions, one part is plain white the other is mixed with red coloring or green pandan(screwpine) juice. Then, both sides are joined together and roll out before pinching a small portion, roll them into tiny balls in between both palms. 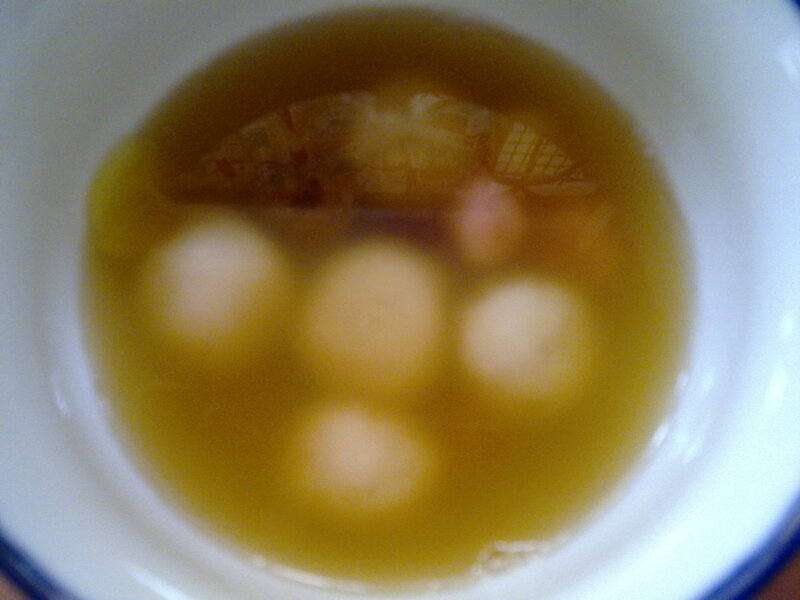 Some purposely make big glutinous rice balls to add in different fillings into the “Tang Yuan”. Now, you can purchase a vast varieties of “Tang Yuan” at hypermarket ranging from all sorts of fillings such as red bean paste, black sesame seed , kaya, coarse peanuts, black bean paste, yam (Taro) or pandan ( screwpine). In a big bowl, mix 2 cups of glutinous flour with 1 tbps of granulated sugar. Stir a bit. Add some plain water into the flour and knead to form a dough. You should form a soft dough that does not sticks to your hands. If it still does feel sticky, add a little more flour to get the right consistency. Divide the dough into 3 portions. Add in 2 drops of food coloring (Red Rose Flavor) to the one portion of dough and another coloring (Green Pandan Flavor) into the other dough. Do not add anything into the 3rd dough. Let it be natural white. Sprinkle some flour onto a flat plate so that the rice balls do not get stuck onto it which you may find it difficult to remove the rice balls later. Start from the red dough. Roll it into a long dough that resembles a stick. Use a butter knife to cut them several small sections. 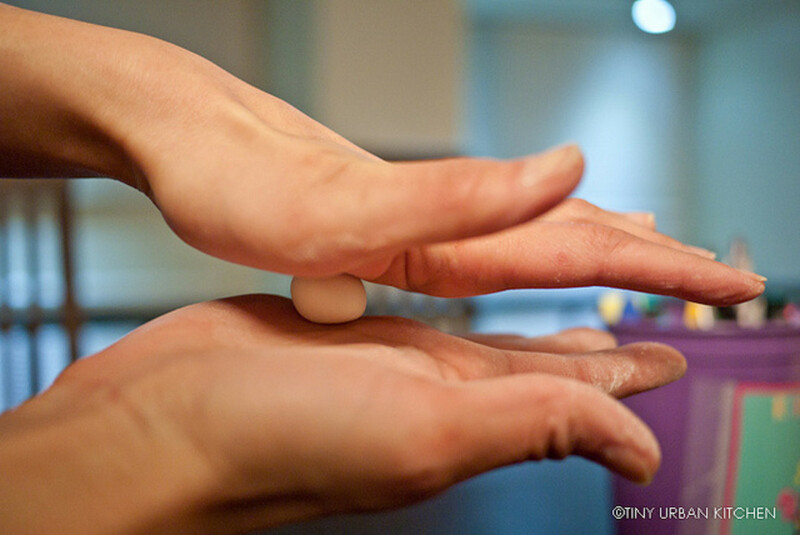 Roll each section into a small marble ball by using both palms. Repeat until the red dough is used up. Repeat the same procedure for the green dough and white dough until you get many marble balls. Next, the sweet soup. Boil half pot of water. It is wise to use a big soup pot if you are making 60-100 rice balls depending on the size you had rolled. The bigger rice balls, use medium soup pot. 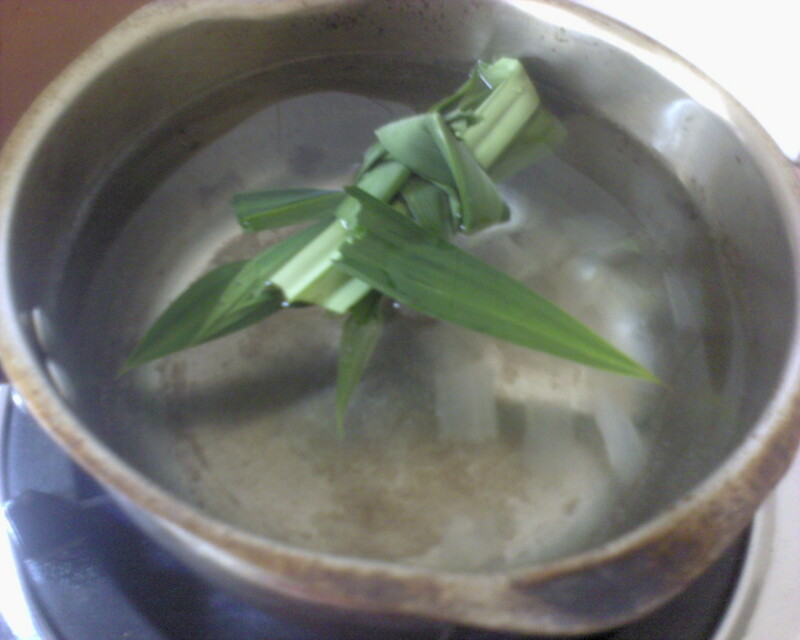 Add in knotted screwpine leaves (pandan) and let it boil under medium fire for 5-10 minutes. Add in some brown rock sugar or 2 tbsp of granulated sugar ( as according to your taste). Add in a piece of slightly pounded ginger. Test the soup. Add in another 1tbsp of sugar if it taste bland. Add in colorful rice balls , one at a time into the boiling soup. Lower the fire. As soon as it floats, quickly transfer the “floated” rice balls into individual rice bowls. When the rice balls floated, this means that they are cooked and ready to eat. Scoop some sweet soup into the rice bowl and serve hot. You can opt out the ginger if you don't like the taste. Use brown rock sugar or white rock sugar for natural taste. If you don't have any, just replace it with granulated sugar or brown sugar. Do not be LAZY! Do not pour in all the rice balls into the boiling soup. They will stick together to form a big messy ball. Adding one at a time allows the rice balls to float at different areas in the soup. Once, the rice ball floats, remove them immediately. Otherwise, the rice balls will turn out too soft and dilute into the sweet soup. Some old folks prefer to add in sweet fillings into the rice balls. You can add in copped roasted peanuts mixed with sugar, black sesame seeds or red bean paste which are popular. However, for those rice balls with fillings, remember to dish out the rice balls immediately when they floats as the fillings will burst into the sweet soup too. I wish America had an "acting more responsibly" holiday. 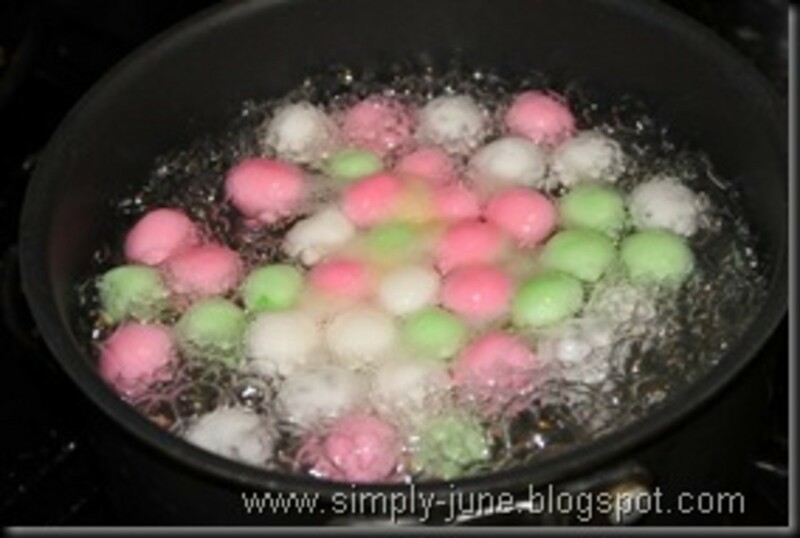 I enjoyed learning about the traditions of Dongzhi and about tangyuan! Very informative hub! Voted up! Great hub...such interesting history and the food looks so tasty. Knowing the history will make it that much more pleasing to consume. New learning for me. I will definitely look for a place to try this. These look like they might be good with that purple bean paste filling. I will need to ask my Chinese friend about the winter solstice celebration. That one slipped past me. 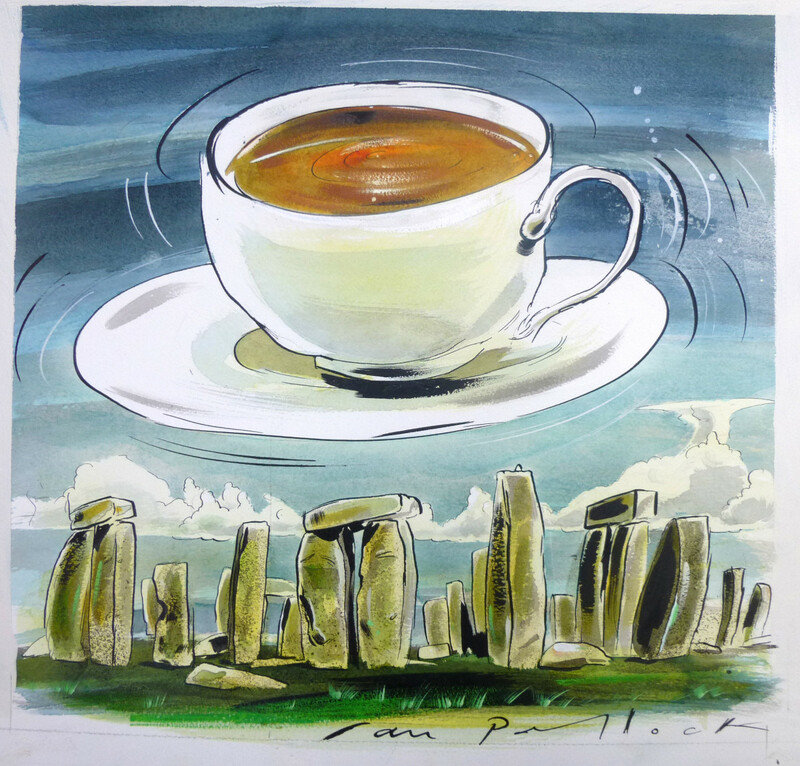 I have never heard of this soup nor tasted it but enjoyed learning about the festival and how it originated. Thanks for your recipe. I've never heard of these before, but they sound good. I love traditions. What a wonderful hub! This looks like great fun! I really enjoyed my time in China. We try to do a feast every year with Asian foods, mostly Chinese. This is definitely going into the recipe stack for the next one! 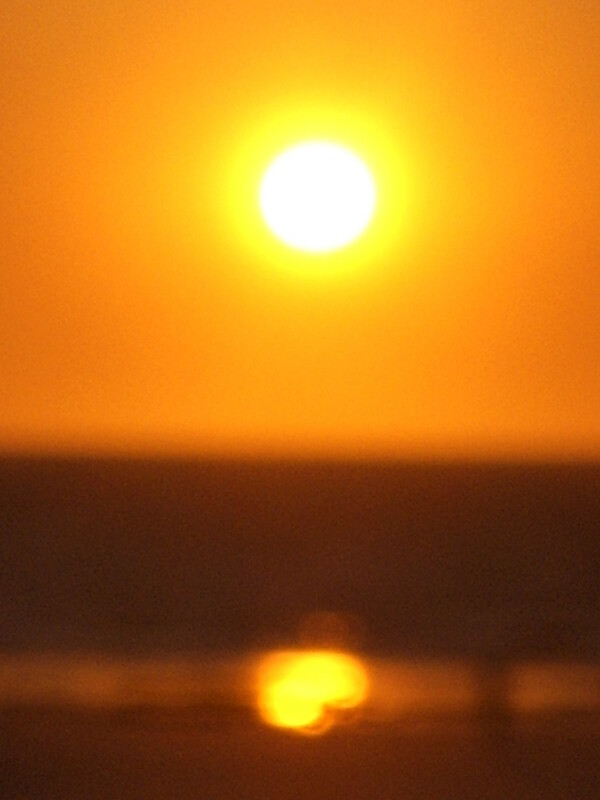 Interesting how every culture has its winter solstice festival. We are a couple days short of Christmas, which is basically our winter solstice festival. Great hub! Very interesting Chinese folklore story. I will have to see if I can get these in a Chinese restaurant. Wow... What an excellent recipe. Thanks for sharing. Unique and so worth a try a quick and easy to follow recipe. Interesting hub and a nice presentation of the festival. Also the recipe for the Tang Yuan seems nice. Thanks for sharing. Thanks for reading. There are many more chinese cultures that I had not written yet! Thanks for reading. Glad to share something with you guys! Thank you for sharing this hub, PeachPurple! I never heard about this festival before! Very interesting! The great thing about hubpages is learning new things everyday. For me, this article is a new piece of information despite the fact that I lived among friends who are Chinese. Now I know more of the cultures! Thanks for sharing. Interesting hub. Voted up. Nice photographs. I never know about this festival. Thanks for sharing.